ANNISTON, Ala. – Blastcrete Equipment Company introduces the Mine Mate, an innovative machine designed to mix and pump concrete material for underground mine sealing and stabilization, grouting, and various other shotcrete applications. The Mine Mate enhances safety in underground mining and tunneling applications, and is a convenient solution when ready-mix concrete is not an option. Featuring Blastcrete’s X-10 ultra-high pressure swing tube pump, the Mine Mate is a highly productive and reliable machine that’s also easy to operate and maintain. Created at the request of several customers seeking a machine to apply shotcrete in underground coal applications, the Mine Mate was developed, and utilizes the wet-mix shotcrete process. In contrast to the dry shotcrete (gunite), the wet shotcrete process minimizes dust emissions and improves visibility making it much safer, particularly for underground use. Featuring a compact and extremely low-profile configuration, the Mine Mate is designed for operation within a 4-foot ceiling. The Mine Mate includes Blastcrete’s X-10 3-inch, high-pressure swing tube pump, and a high-shear continuous mixer. The unit is capable of mixing and pumping 12 cubic yards per hour, and can handle aggregate up to 3/8″ diameter. Offering the highest piston face pressure in the industry at 2,200 PSI, it can pump material in excess of 500 feet, horizontally and vertically. Additionally, the hydraulic pump can run in reverse to eliminate line pressure from the delivery line should a hose plug. This is a very important safety feature in any pumping operation. Unlike competitive swing tube pumps, the X-10 provides easy access for cleaning and maintenance. The receiving hopper of the pump is mounted with a heavy duty hinge so that it can easily swing away from the swing tube section. The flat pack is held in place by four heavy-duty bolts so that the spare flat pack can quickly and easily be replaced. This assures that downtime will be all but eliminated. An optional hydraulic pressure washer is available for quick and easy cleaning of the mixer and the pump. Available power options include a V3600, 66-horsepower Kubota water-cooled diesel engine or 50-horsepower electric motor with starter and disconnect. The machine can also be equipped with a material screw conveyor, with bin indicator for charging the continuous mixer. The Mine Mate’s X-10 is CE Certified, meeting European Union safety standards for equipment operation, and the entire unit is backed worldwide by Blastcrete’s unmatched customer service and support. 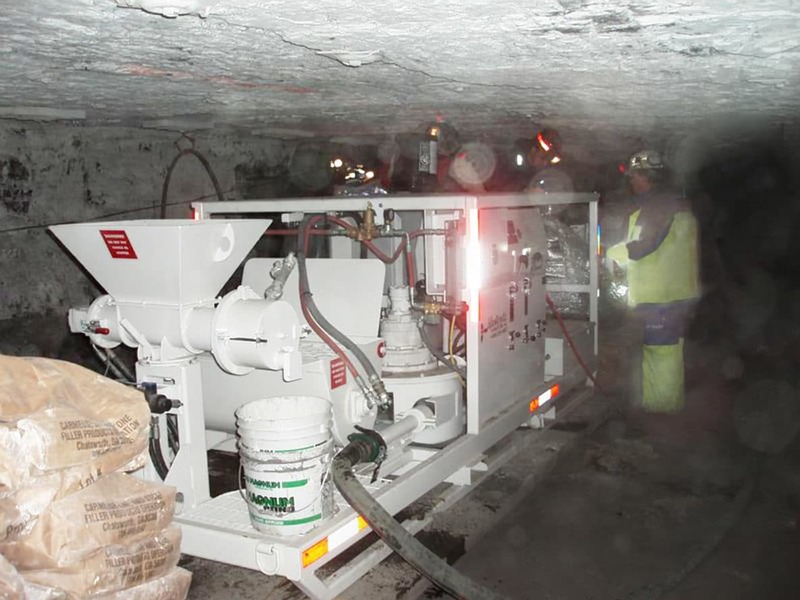 To accommodate even the most unique and challenging underground applications, Blastcrete offers the option to customize the machine to suit any end-user’s specific needs.